"Now come and have some breakfast!" Jesus said. None of the disciples dared to ask him, "Who are you?" They knew it was the Lord. Then Jesus served them the bread and the fish. This was the third time Jesus had appeared to his disciples since he had been raised from the dead. Here is the resurrected Lord, the King of Glory, and he is preparing breakfast for his disciples. How fitting! 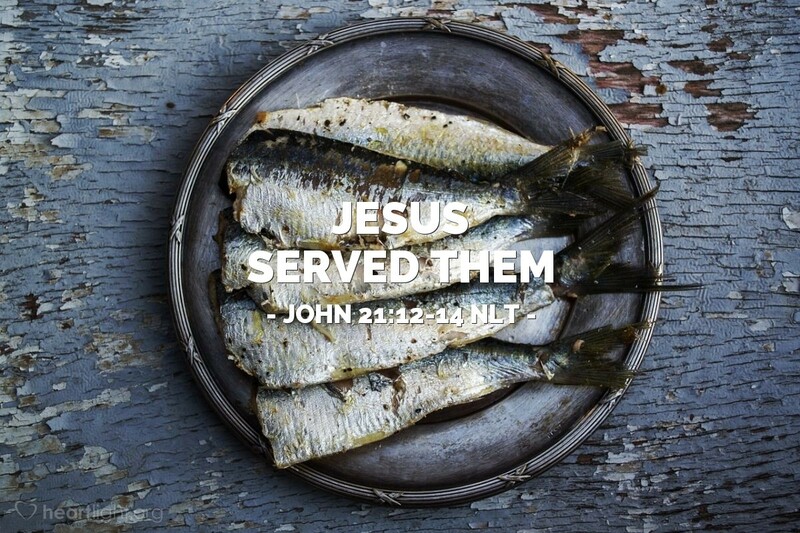 Jesus didn't come to be served, but to serve. His leadership was courageous and bold but always filled with compassion and practical service. He is our hero, and in his moment of glory, Jesus is the servant to those who failed him. Bosses may get a lot out of workers, but servant-leaders put a lot into workers so that the work gets done and the workers are blessed. No one has to question their leadership, because those who follow servant-leaders are sure of it! Father, since your Son and my Lord could serve those who disappointed him, then so can I. Since Jesus can serve when he is powerful and glorious, then so should I. So, dear Father, use me as a servant and convict me when I am not. In Jesus' name, I pray. Amen.